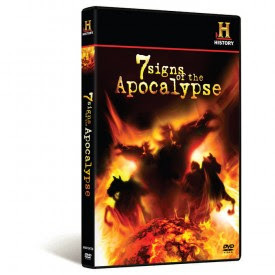 I watched a video called "7 signs of the Apocalypse" from the History Chanel. I found it amusing but overall horribly one sided. They talked as though believing the "7 sings" and believing the book of Revelation were synonymous with believing in a literal and dispensationalist narrative of the End Times. I could have been offended by this but, who's to judge, it's the History Chanel. They introduced folks like Joel Rosenberg and Tim LaHaye as "Bible Scholars" which is a slap in the face to real scholars who actually participate in scholarship. They discussed passages of Revelation without giving a single thought toward what the author may have believed about what he/she was writing in the original context. For example, when they talked about the Antichrist (by the way, they never mentioned that such a word does not show up at all in the text of Revelation) they portrayed him as someone who will be "such a lover of peace" (which hurt my heart because that made people like John Dear, Desmond Tutu, and all of our Mennonite brothers and sisters sound like candidates for the position) that people will want to follow them. They never bothered to mention that Caesar, in the original context of the scripture, was all about Pax Romana which means the Peace of Rome... They didn't even consider that the beast of Revelation could have something to do with Caesar or someone like him--someone who promotes peace but conducts war and conquest. There were no bible scholars interviewed in the video, just dispensationalist propagandists. Without going into detail, I will say that the overall message of Revelation is a call to oppressed people to carry on in the midst of their oppression because victory is on the other side of martyrdom and a call to wealthy and powerful folks to end their involvement with the systems of death and oppression, to live in such a way that "the beast" might actually want to kill you, and to come out of those systems which kill and oppress God's people. As for the church's faithfulness to this call, there is little to be said outside of obscure stories and individual examples (i.e. Martin Luther King Jr. and "church" efforts such as "the Simple Way"). The Church, especially the American Church, is still quite buddy-buddy with the Beast and quite enticed by the Whore of Babylon. However, it was interesting at the end of the video to hear from a "Bible Scholar," who has made plenty of money by writing a book and taking advantage of the economic system, who probably lives quite well-off in the United States, and who should know, through the lens of Revelation, that the beast is alive and well in American systems of economics and "defense," that "the book of Revelation has never been read with more earnest true belief than it is today" (Jonathan Kirsch, author of A History of the End of the World). Not only is this arrogant to say, it is profoundly telling. The dispensationalist perspective on Revelation which calls for a hermeneutic of "decoding" current events and inserting them into the framework of "end times prophesy" is ironically prepositioned to miss the point of Revelation altogether. Someone who can, while looking at our culture where the Church is so heavily involved in the systems of the world and is apparently getting along quite well with them, say that "the book of Revelation has never been read with more earnest true belief than it is today" cannot be someone who actually understands Revelation (unless they have a pitifully bleak outlook on the history of the Church preceding today). That's the irony of dispensationalism... it predisposes its adherents to blindness toward the message of their most beloved book because it distracts them and entices them to use it as a key to decode symbolic signs of future events. I was thinking of similar points about the Beast yesterday. Revelation presents him as a seven-headed monster, which in ancient Near Eastern culture represented or epitomized chaos and destruction. Yet, some conservatives like to identify anyone who talks about peace and making the world a better place as the "Antichrist." I wonder if there's a way to get away from that, without doing violence to the NT passages in which the deceivers use "peace and safety" as a slogan. Perhaps one answer is that Rome was highly militaristic and imperialistic, yet it used the slogan of peace. indeed you're right. It shouldn't be too hard to get away from that, all we have to do is strip from our presumption the desire to dehumanize certain folks who have sacrificed more than we think we could out of our desire to be justified in our mediocrity. If we stop putting the target on folks like Gandhi and MLK and start putting it on those who, like George W. Bush and Barack Obama with him, claim violence as the means to peace just as Caesar did through the propaganda of Pax Romana. Not that we should in turn dehumanize those folks by labeling them as dark figures beyond redemption (as we would if we chose to use the language of "antichrist"), but we should seek to excommunicate such propaganda from the table of Christian eschatological vision. Wow, this was a beautifully written and articulate argument. My family sort of grew up reading The Left Behind series and the like and really thought that Revelation had been interpreted rightly for my entire childhood - but in the way you mentioned: inserting current events into the context of Scripture. Wes, I do not think that Yahweh is anti-violence or that if one uses violence that makes them anti-Yahweh. The OT is wrought with examples of God telling Israel (or individuals) to go to war and Jesus never condemns this but instead embraces the Tanakh. Just a thought. I'm probably misunderstanding your comment. I think most of us grew up with the Left Behind series as our guide to Revelation, and tragically this reflects on the way we conduct ourselves politically. And no, you did not misunderstand my comment. I do believe Yahweh is thoroughly "anti-violence" in terms of war and aggression. Though the elements of this conviction grow complex as we approach specific texts, in simplistic terms I believe that the Old Testament is overwhelmingly non-violent besides a minority of exceptional passages (God disrupts violence with creation) including the ones you probably have in mind (the prophets often provide correction to violent thinking). And, as a Christian, I believe that Yahweh is revealed in the life, suffering, death, and resurrection of Jesus Christ who loved more deeply than he feared. Jesus commanded peter to put down his sword in the moment of moments when violence could otherwise be justified--for the defense of his beloved. Jesus offered his life for his enemies and defeated violence with love through glorious resurrection. Jesus gave his life as a alternative to taking life and he asked his disciples to "follow" him and to be like him saying "as the father sent me I am sending you" (John 20). The church must at very least refuse to kill the ones for whom Jesus gave himself (that's everybody).